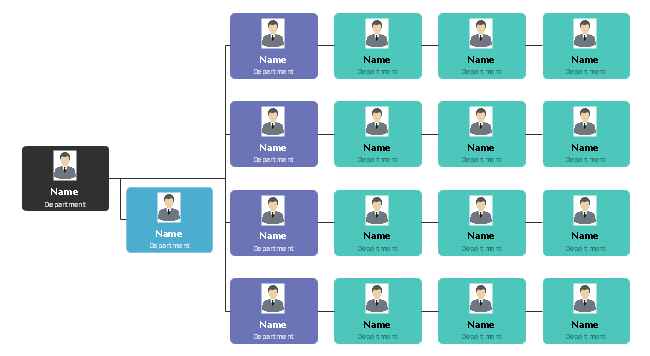 A marketing organizational chart helps marketing employees to quickly find their target workmate as well as showing key roles to the whole company. You can see more details by clicking on any of these templates. Marketing org charts with job titles are great resources for HR professionals to visualize their current organizational or department structure, create scenarios to plan for any changes, and to communicate organizational information across the enterprise. The marketing org chart with photos here shows you an ever quicker way to find the target staff. You can insert employee photos at the top, right or left hand side of an employee shape. 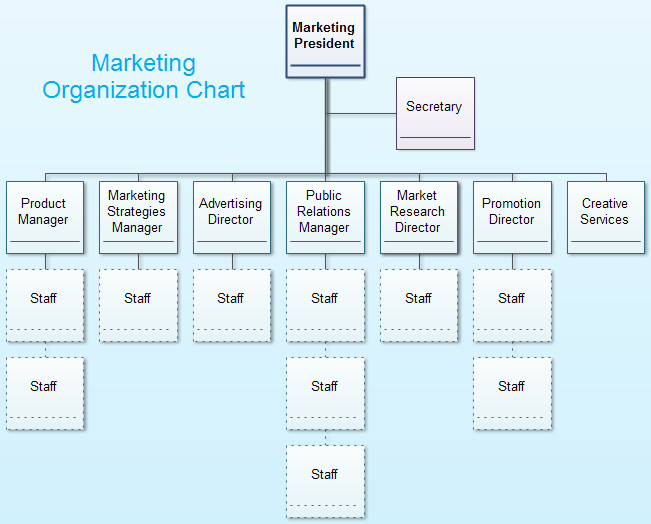 The third marketing org chart template here offers another productive solution to manage your marketing team. This is especially useful for international firms to manage their marketing programs. Marketing Presidents plan and create marketing strategies for products or services for their company. Marketing Managers generally carry out marketing strategies for their company, which may include creating marketing messages, choosing mediums, such as website advertising or print advertising, and undertake other marketing campaigns and programs to reach the target user group. Marketing Strategies Managers usually plan and writes marketing plans. Advertising Directors often work with external agencies or business partners to plan and execute advertising programs. Market Researcher Directors explore the target user group of the company and also do competitior analysis. Public Relations Managers focuses on managing the marketing budget by choosing the right forms of advertising. Moreover, as the media spokesperson of their company, public relations managers also conduct interviews with media. Promotion Directors generates interest and ramps up interest to potential customers. Creative Services Managers are usually graphics and webs designers who assist in portraying promotional materials to the public.